Rider - Heiner Jeibmann - ein internationaler Pferdesportexperte. Mr. Jeibmann has internalised modern dressage. 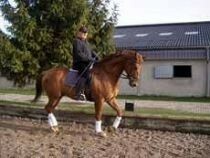 Mr. Jeibmann is an experienced, active rider and trainer up to Grand Prix exercises.